Let’s just get it out of the way now. This is the best pho in Denver hands down. So...deuces I guess. All the Pho 95 fans just rolled their eyes, but we speak the truth. 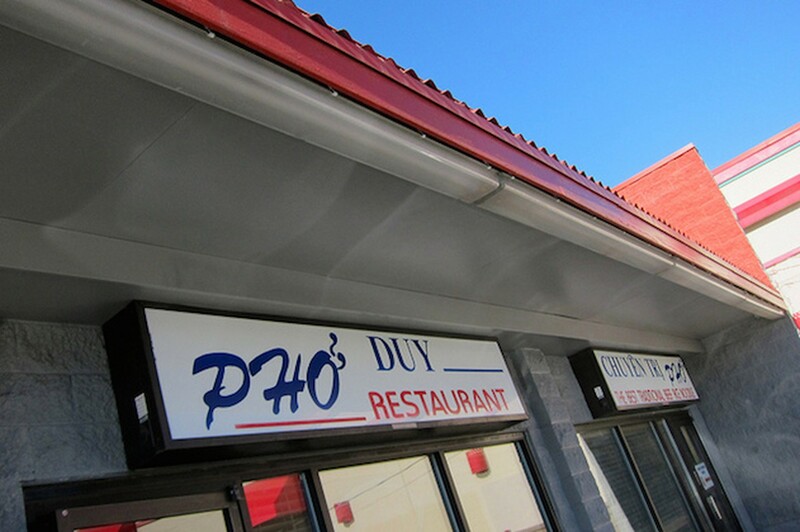 Consistency is what separates the good from the great and Pho Duy is the most consistent place in town. The four and a half Asian people we know from Denver have been coming here since the late '90s and that’s good enough for us. The atmosphere at Pho Duy is sort of like a Vietnamese version of the karaoke scenes from Only God Forgives, minus all the murder and red camera filters. Pastoral paintings and non-English versions of pop standards somehow feel like home. The shocking thing is how un-Denver the crowd is. It’s practically diverse. This is Federal Boulevard at its best and everyone is welcome. Pro tip: park on the side street. You are seriously taking your life (or at least your deductible) in your hands in that narrow parking lot. Also, please don’t embarrass yourself by ordering a small bowl because you’ll just end up staring longingly across the table as your companion engulfs another big hit of noodles. The water glasses are filled on occasion, but you are otherwise left alone to get your slurp on. “Pho Only” is the translated name of the restaurant, and we take that as an instruction. Sure, you can check out the spring rolls, boba, or other flotsam and jetsam, but why mess around? We’re here for pho. The broth is so rich and sustaining you can practically feel your red blood cell count going up. The traditional jungle of fixings, including bean sprouts, basil, dandelion, jalapenos, and limes are all there, as is a sidecar of incredibly craveable hoisin. Add liberal amounts of sriracha and you’re golden. Our go-to is the rare steak and well done brisket, which gives you the feeling that you could wrestle a bear. If you want more control of the doneness of the steak, just ask for it on the side. The chicken is also f*cking spot on every time and offal fans can have all the tendon and tripe they could want. Enjoy the pho puns.